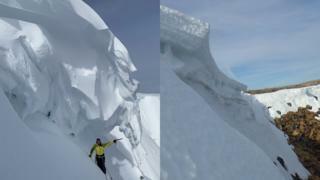 A huge ledge of snow called a cornice that formed on a Lochaber mountain has melted in February's warm weather. Cornices are formed by wind-blown snow and can collapse under their own weight and cause avalanches, often during a thaw. The Scottish Avalanche Information Service's (SAIS) Lochaber team took an image of the cornice on Aonach Mor on 11 February. A new picture taken on Wednesday shows that much of it has melted away. February has seen record breaking temperatures. On 21 February, Aboyne broke Scotland's February temperature record which had stood for more than 120 years with a temperature of 18.3C. Earlier this week, the UK broke the record for its warmest winter day twice with a temperatures of more than 20C recorded in Wales and England. Colder weather has been forecast for Scotland this weekend, with snow possible in upland areas in parts of the Highlands. Mountaineering Scotland has warned walkers and climbers to be aware of the forecasted "dramatic change" in weather. It said freezing levels were expected to drop below summit level from Saturday onwards and snow was forecast. Safety adviser Heather Morning said: "It's important to consider our mind-set. Over the past two weeks it very much felt like winter was behind us, so it would be all too easy to get caught out in the wrong place with the wrong kit. "Planning is key this weekend to make the most of our return to winter." The Scottish Avalanche Information Service assesses avalanche risk from late December until about mid April. Last week Iain Cameron, whose research on snow in Scotland is published by The Royal Meteorological Society, said there had been a lack of snow this winter. He said the winter of 2018/19 had been among the "most snowless of the last 70 years".